Btw, sorry for all the typos... I use my phone and the touch screen and auto correct hate me. 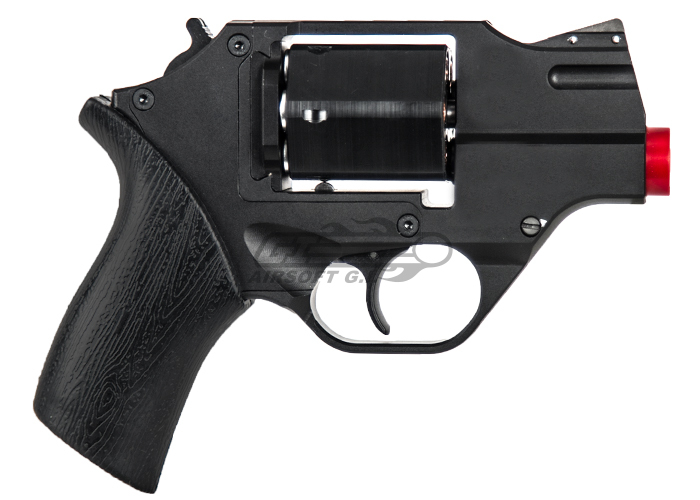 This is a CNC Aluminum gas revolver, hence the price. In other words, its machined in much the same way a firearm is made. The other replica of this gun is made by Tanaka and I believe it is extremely rare. Iron Airsoft makes limited run guns, so the price is not surprising at all. You'll see guns come and go, but a custom GBB is gonna run you at least a grand - I'm not talking about putting new grips on your KWA and calling it custom - a fully custom gun - complete custom body, replace the internals, inner barrel, and gas system, and fine tuning - easily a grand. If you're basing it off a high end gun - Western Arms, Marushin, Maruzen, Tanaka, etc, expect $1500 or more. You get whatever you put into this hobby. Some people want a working gun to skirmish while others want to display piece. A limited run gun can often times be an investment. Even at $700-$800, when this production run is done, you may see collectors easily pay more to get one or you may end up seeing them all go on eBay for $50. Tanaka had a 600fps 8mm setup that ran $2500-$3000. Asahi M40s (Holy Grail of airsoft M40s) have gone on the traders market for $2500. I understand Airsoft is a hobby....But it's not worth paying that much...Granted, I've paid quite a bit of money on it, but come on...I thought a PTW was pushing it, but $720 for a little pistol? So what if it's gas and CNC. I could buy a REAL pistol for less than that. Yeah, it'll probably be low caliber and garbage, but I could. Some people can't own guns in their country. This might be the closest they get to shooting stuff. Then you gotta think that there's people here on AO who go crazy for stuff like this and wouldn't mind paying the price. Just a matter on how much you're willing to spend on your hobby. Personally, I play airsoft for the fun of it. Not to out-fab my opponent with the latest gear and camo.